Gun Ownership vs. Gun Control - Which do Americans prefer? 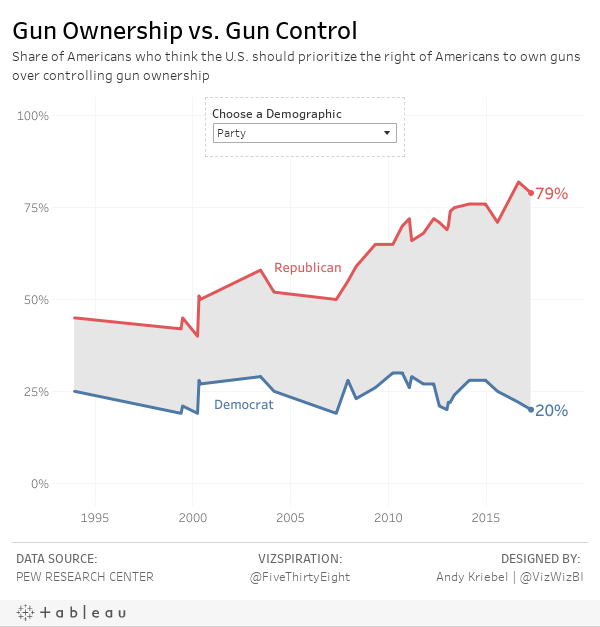 Earlier today I posted a viz from FiveThirtyEight about the growing divide in opinion about gun control and gun ownership when comparing political affiliation. I was quite inspired by the simplicity of the viz and how effectively it communicates, so I decided to use it for vizspiration. The data used was readily available on Pew Research Center, so I used Google Sheets to import the data. Since FiveThirtyEight focused their viz on those people preferring gun rights over gun ownership, I only used that metric. However, on the Pew Research Center website there are many other ways that the data is sliced demographically. I started by trying to create a single dashboard that contains each of the demographics displayed simultaneously and it was a mess! In the end, I went with a parameter to allow the user to choose the demographic they are interested in. Overall, there's been a steady increase in the percentage of people preferring gun rights over gun control. Sounds like the NRA's propaganda is working. As stated by FiveThirtyEight, the gap between political parties is growing larger and larger. In the most recent poll (7 Apr 2017), only 20% of self-identified Democrats favored gun rights over gun control, whereas 79% of Republicans favored gun rights. It's this growing partisanship that is really damaging America. The younger generation is less likely to favor gun right over gun control. Is the proliferation and accessibility to information from the younger generation signaling a shift towards more liberal views? The most educated Americans favor gun control over gun rights. Are the undereducated preyed on by the NRA machine? The gap between whites and blacks is as stark as the gap between Republicans and Democrats. 30% more whites than blacks prefer protecting gun rights. Regionally, the South and Midwest prefer gun rights compared to the West and Northeast. This pretty much aligns with any election map you look at. People that live in cities are 26% less likely to favor gun rights over gun control compared to those lives in rural communities. Again, this falls pretty much in line with political affiliation. UPDATE: Thanks to Rody Zakovich for this great tip for shading between two lines. Much better than my area chart trick!